A recap of Game One of the Toronto/New York Mets series. Juan Lagares, (Top), went four for five and had three RBIs last night. It wasn't the performance the Toronto Blue Jays were looking for last night against the New York Mets. 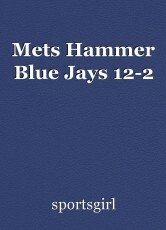 The Mets hammered the Jays 12-2 at Citi Field in New York. What's worse is that Met's pitcher, Noah Syndergaard drove in the first run of the game in the bottom of the second inning. Yangervis Solarte put the Jays ahead 2-1 at the top of the third inning, driving in Curtis Granderson and Justin Smoak with a single. It was all Mets after that. In the bottom of the fourth inning, the Mets scored four runs to go ahead 6-2. New York went ahead 7-2 in the bottom of the fifth inning when Amed Rosario drove in Devin Mesoraco with a single. Brandon Nimmo made it 8-2 when he drove in Adrian Gonzalez with a single. Finally in the fifth inning, Juan Lagares drove in Rosario with a single. Luis Guillorme drove in the Met's tenth run in the bottom of the eighth inning. Finally, Mesoraco capped the game off with a two run homer. Lagares went four for five at the plate and collected three RBIs. Mesoraco went two for four at the plate and collected three RBIs last night. Toronto's startng pitcher, Jamie Garcia, had a terrible night on the mound. Garcia lasted 3.2 innings, giving up six hits, six earned runs, three walks, and struck out just three batters. Syndergaard gave up five hits, two earned runs, two walks, and struck out seven batters in five innings pitched. The World Cup Bringing The World Together..